These words – flamboyant and striking – of the Persian mystic poet, Jalāl ad-Dīn Rūmī (XIII century), express in a flash the value of intercultural experiences (interculturality) and how integral they are to a possible way of encounter and the building of positive relations beyond the initial differences. The vocabulary defines interculturality as “coexistence, knowledge and exchange between individuals and groups of different cultures”. It’s a dimension that the Canossian family, present in 32 countries in the world of five continents, knows well because it is part of its DNA. It is called to live it in an ever more evangelical and prophetic way. Yes, because the world in which we live in is in one way interlinked by roads and connections and webs – real and digital – but in another way experiences the temptation to close itself off, to build barriers, to exclude the other, the different from oneself out of fear or selfishness. This is why, being urged by a powerful intuition of our Congregational Leader and her Council, we have chosen to dedicate each of the three issues of this year’s VitaPiù to the theme of ‘interculturation’. This new dimension needs to be deepened and examined, beginning from the very rich and varied multicultural experiences that the Canossian family lives around the world. Our journey begins with this issue and it begins in Europe, the cradle of the Canossian charism. We will go to Africa and the Americas, Asia and Oceania, stopping in all the continents, listening to stories and witnessing. And VitaPiù itself is becoming ever more intercultural. In fact, I thank the generosity of many sisters on behalf of the whole Communication Team. 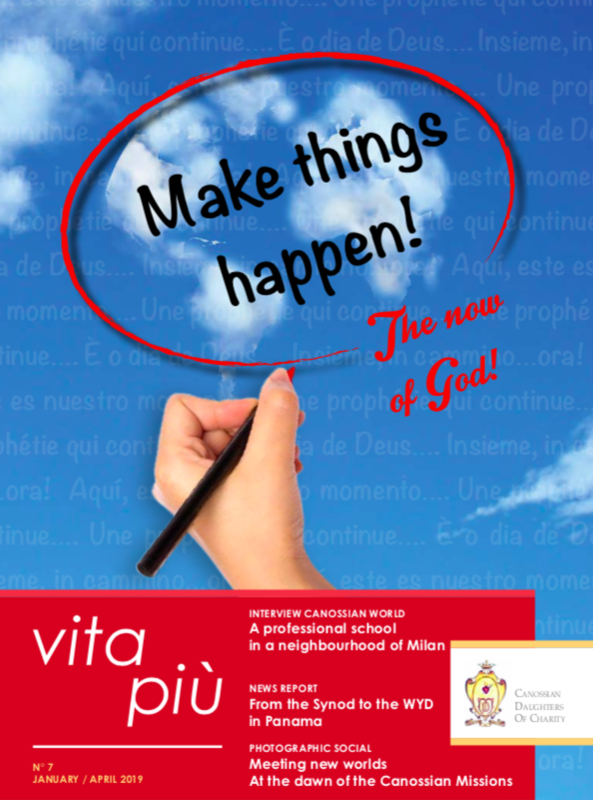 For the first time our Canossian magazine will be available in all the official languages of the Institute and not only in Italian and English, but also in French, Spanish and Portuguese. A Happy New Year to everyone and enjoy the journey!